There are two main areas that must be covered in this answer. The first is to outline what your expectations are of your new crew, and the second is to explain what your crew should expect of you. You need out tell the panel you will sit down with your crew and explain your expectations on everything including fire inspections, training, emergency operations, dress code, and station maintenance. Many new fire officers choose to actually type these expectations out and have their crew sign them. The second part of your answer needs to address what your crew should expect of you. You want to explain how you will perform employee evaluations, how you will schedule training to keep your crew up to snuff, and how you plan to run day to day operations. This is a great question that we have added to our Fire Officer Interview Ebook. Here at myfirejob.com we offer three unique products. We have the Fire Officer Interview Ebook, the Fire Engineer / Driver Operator Ebook, and the Firefighter Entrance Exam Ebook. Most of our attention seems to be focused on our Fire Officer Interview book, but this week we received an email asking, “What is the most important thing that I can do to get hired as a firefighter?” We decided to post some no nonsense real world advice for those seeking to enter the fire service. It’s no secret that competition for these highly coveted fire service jobs is at an all time high. So how can you set yourself apart from the crowd? First lets look at the actual hiring process. Most department will begin the process by having you fill out an application and then taking a written test. The written test is quite thorough and tests things such as basic math skills, reading comprehension, map reading, memory recall, verbal reasoning and judgement, and many other areas. A department will typically take the top 50-100 written scores and invite them to continue the process. The next step is a physical ability test. These range from department to department, but most test usually consist of CPAT style movements and tests. Dummy drags, stair climbs, with pushing and pulling movements for time. These tests typically have a high failure rate for those unprepared. The top25-50 are then usually invited to continue the process and move onto the medical and psychological exams. These tests are done to ensure candidates are physically and mentally capable of doing the job. The final, and most vital step in the process is the interview. These are usually conducted by a panel that includes the Fire Chief, other high ranking fire officers, and possibly department heads from other parts of the city, such as a police chief. The interview process is stressful and designed to give the panel a better idea of who you are. So back to the original question, how can you set yourself apart from the other candidates? The first step is to prepare for the written test. Dedicate every free minute of your time to it. There are no shortcuts and the competition is fierce. Grab a good study guide that will walk you through each part of the written exam and help you prepare for them. 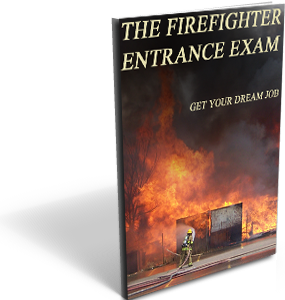 We’re partial to our firefighter entrance exam ebook. You’re best opportunity to set yourself apart from other candidates will come during the interview. This is where you’ll get a chance to showcase your resume and speak to your skills and abilities. Make sure the study guide you purchase covers the oral interview (ours does). You want to always highlight how trainable you are. Honestly regardless of where you came from, that is the number one thing most Chiefs want in recruits. Trainability. If you can convince the panel that you’re easy to train, always have a positive attitude, and wish to dedicate your life to helping others, you will have success. Last week we received an email from a customer who had just completed his Fire Engineer / Driver Operator Oral Board Interview. He was asked one question that was not addressed in our Fire Engineer and Driver Operator Interview ebook. We liked the question so much that we added it to the ebook. Thanks for your help with my payment, I’m not sure what I was doing wrong. I just finished my interview and wanted to give you an update. I was asked 11 questions and 9 of them were directly out of your book. One question was related to a recent event in our department so it wouldn’t really apply to anyone else, however the last question I was asked might make a good addition to your ebook. They asked me, “As an engineer, what steps will you take to provide exceptional customer service on calls?” This question was a bit tricky because its hard to put into words the actions we take for granted each day. If you like the question feel free to use it in your guide. By the way, I smoked the interview. Phillip’s question is a really good one. We all strive to provide a high level of customer service, that goes without saying. So the question is, how do you say what goes without saying? Putting it into words is tricky so here is an example that may help you get started. My goal is to provide exceptional customer service regardless of my position within our department. As an engineer I will have some specific goals that will help me reach this goal. The first is to know my new territory like the back of my hand. This allows me to navigate accurately and eliminate mistakes driving to calls. The second is to familiarize myself with my new territory’s buildings, and commercial structures, including plug locations and fire alarm panel locations. This will allow a seamless transition for the days when my lieutenant is off and I fill into his position. I will continue to go out of my ways to help customers in both emergency and non emergency settings. One thing we always do after each call is ask if there is anything else we can do for the patient that day. Many times our older patients will ask for a cup of water, or if we can bring in the newspaper. Little things like this can go a long way with out patients and customers. Thanks for the solid question Phillip. 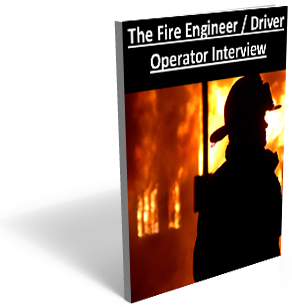 We have added it to our Fire Engineer / Driver Operator Interview Ebook. A neighboring department recently conducted Fire Captain interviews for 7 candidates. I was asked to sit on the oral board and help evaluate the candidates. This is one of my favorite things to do because it always gives me such great insight into the preparation and stresses of an interview. One of the captain oral board questions that we asked to each candidate was a very good question. 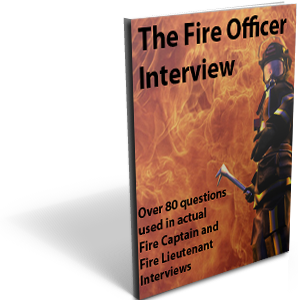 We liked it so much that we have now added it to our Fire Officer Interview Questions ebook. This question is a little “out there” but it gives the panel good insight into the thought process of a candidate. Your Fire Chief sends out a memo that requires you to unload and wash every section of hose on the pumper once a week, and reload the truck with clean hose. He read in a magazine that this will lead to better service and performance. How will you deal with this situation? Key Points: This is an obvious loaded question. No Chief in the world would accept this amount of out of service time from his units. The point of this question is to hear the thought process behind the candidates’ answers. Are they going to say “No, I will not follow that order” or will they say that they will find a solution that benefits everyone? Example Answer: As a Captain it is my job to help the department reach its organization goal of protecting life and property. It is also my goal to provide honest and valuable feedback both up and down the chain of command. My first step is going to be following the new order. This new memo will require a great deal of out of service time working with the hose. I would also check with out hose manufacturers for recommended care and storage of our hose and see what they recommend. If I had an idea that would lower our out of service time, allowing us to serve the public better, and maintain high performance and reliability from the hose, I would put together a letter with my findings and recommendations and forward it up the chain of command. I must stress that my job is to follow orders, and I will follow this one, however it is also my job to ensure my crew is always at a high level of operational readiness. Our job is to be in service and available to help the citizens as much as possible. Our command staff values feedback from the line officers and would work with me to improve our service to the community. For 2013 we have updated our Firefighter Entrance Exam Guide. In addition to our Fire Officer Interview Ebook, and Fire Engineer / Driver Operator Interview Ebook, we are proud to offer our updated Firefighter Entrance Exam Ebook. This ebook is an amazing study tool that will give you the information you need in order pass the entrance exam with flying colors. Our Ebook provides effective study habits, time management strategies, answer strategies for questions you’re unsure of, test day tips, and how to combat test anxiety. Our ebook also provides a sample written exam for you to practice with. After we cover the written exam we move onto the physical agility test. We walk you through each section of the most common physical agility tests including the CPAT. We provide strategies and techniques to help you pass with flying colors. We also provide sample oral interview questions for you to study and practice answering. The oral interview is one of the hardest parts of the evaluation process. Many candidates struggle with this area and our guide is a great preparation tool. After the interview section we move on to cover the medical and psychological exams. We explain the best strategies for passing these exams, and how to handle any issues that may arise. Last week we received an email from a Fire Engineer / Driver Operator candidate. He wanted to share an interview question with us that was not covered in our ebook. Below is his email. Thanks for your help downloading the book to my other computer, I am as computer illiterate as they come. I had my interview yesterday and it went very well. The panel asked me a total of 12 questions. 1o of them came almost verbatim from your book. It was a huge help and really prepared me for the interview. I know you guys add questions to your book so maybe these can help someone else. 1. While at a vehicle extrication call you witness a crew-member from the ambulance standing on top of the car trying to kick in the windshield. You feel this is very unsafe due to the instability of the car. How will you handle this situation? 2. As an Engineer you will be required to step up to the role of company officer from time to time. How do you plan to prepare yourself for this responsibility? Thanks for the email Frank. We have already added these questions to our Fire Engineer / Driver Operator ebook which you can view at the link below. The fire officer oral interview questions are always a challenge. Not only are they challenging questions, but as a promotional candidate, your nerves and anxiety are at high levels. The stress of a fire officer oral board interview is hard to deal with, there is not a quick answer that will help you control it. As with most things in life the harder you work in your preparation, the greater your reward. We have spent nearly five years gathering questions from interviewers and promotional candidates for the position of Fire Captain and Fire Lieutenant. We have compiled these questions into an ebook that has over 80 of these questions. We believe this is the best way to prepare for a fire officer oral board interview. It allows candidates to get a preview of the questions they will likely be asked. The feedback we receive shows that our book typically covers about 90% of the questions asked in these interviews. It really is like having the questions in advance. You can view our feedback here. Here is a question from a recent fire engineer interview that we just added to our Fire Engineer Interview Guide. You are a newly promoted engineer at a station with an old firefighter who does not like wearing his seatbelt when responding to calls. How will you handle this situation? This answer may be a little too blunt for some candidates, but it illustrates a no nonsense approach to the problem. It also shows the candidate’s commitment to safety and that he takes it seriously. Most departments have mandatory seatbelt SOPs. You can find this question and many many more in our Fire Engineer Interview Questions.